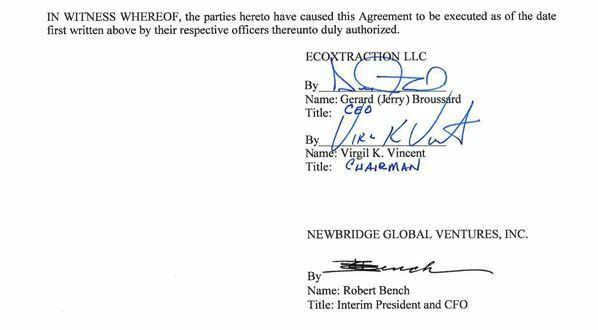 This Asset Purchase Agreement (this “Agreement”), dated as of February 14, 2019, is entered into between ECOXTRACTION LLC, a Louisiana limited liability company (“Seller”) and NEWBRIDGE GLOBAL VENTURES, INC., a Delaware corporation (”Buyer”). (b)“Contract” means any contracts, leases, deeds, mortgages, licenses, instruments, notes, commitments, undertakings, indentures, joint ventures and all other agreements, commitments and legally binding arrangements, whether written or oral. (c)“Owned Patent” means U.S. Application Serial No. 15/240,450, entitled, “Method And Apparatus For Extracting THC And Other Compounds From Cannabis Using Controlled Cavitation”, together with any pending patent or patent that issues based in any part upon the foregoing patent(s) or patent application(s), any foreign applications and foreign patents corresponding thereto, including patents to be obtained by any non-provisional, continuation, continuation in part, division, renewal, substitute, re-issue or re-examination application, and extensions thereof. (d)“Hydro Patents” means (i) U.S. Patent No. 8,430,968, entitled, Method Of Extracting Starches and Sugar From Biological Material Using Controlled Cavitation; (ii) U.S. Application Serial No: US 15/085,616, entitled Aging Of Alcoholic Beverages Using Controlled Mechanically Induced Cavitation, including the corresponding PCT Application Serial No. PCT/US16/025583 and corresponding applications in the EPO, Mexico, Canada, and South Africa; and (iii) granted patents Canada 2409132, Germany 1289683, France 1289638, GB United Kingdom 1289638, Italy 1289638, and South Africa 2002/9328, all entitled “Highly Efficient Method of Mixing Dissimilar Fluids using Mechanically Induced Cavitation”; all of the above together with any patent that issues based in any part upon the foregoing patent(s) or patent application(s), any additional foreign applications and foreign patents corresponding thereto, including patents to be obtained by any non-provisional, continuation, continuation-in-part, division, renewal, substitute, re-issue or re-examination application, and extensions thereof. (e)“Intellectual Property” means all intellectual property, including, without limitation, (i) all inventions (whether patentable or unpatentable and whether or not reduced to practice), all improvements thereto and all patents, patent rights (including patent applications and licenses), patent disclosures, together with all reissuances, continuations, continuations-in-part, revisions, extensions and re-examinations thereof, (ii) all trademarks and service marks (other than those identified as “DEAD” by the United States Patent and Trademark Office as of the date of this Agreement), trade dress, logos, trade names and corporate names (other than those identified as “INACTIVE” or otherwise discontinued), together with all translations, adaptations, derivations and combinations thereof and including all goodwill associated therewith, and all applications, registrations and renewals in connection therewith, (iii) all copyrightable works, copyrights and all applications, registrations and renewals in connection therewith, (iv) all mask works and all applications, registrations and renewals in connection therewith, (v) all trade secrets and confidential business information (including ideas, know- how, compositions, supplier lists, pricing and cost information and business and marketing plans and proposals), (vi) all copies and tangible embodiments of any of the foregoing (in whatever form or medium), (vii) Supplier files, and (viii) any testimonial releases provided to Buyer. (f)“Person” means an individual, corporation, partnership, joint venture, limited liability company, governmental authority, unincorporated organization, trust, association or other entity. (g)“Purchased License Rights” means all of Buyer’s rights under the License Agreement. (h)“Representative” means any officer, director, principal, attorney, accountant, agent, employee or other representative of any Person. , 2018 by and between Seller and Hydro, as amended and supplemented to date. Section 2.02 No Assumption of Liabilities. Buyer shall not assume any liabilities or obligations of Seller of any kind, whether known or unknown, contingent, matured or otherwise, whether currently existing or hereinafter created. Section 2.03 Purchase Price. The aggregate purchase price (the “Purchase Price”) for the Purchased Tangible Property and Purchased License Rights shall be 2,350,000 shares (the “Shares”) of the Buyer’s common stock, par value $0.0001 per share (the “Common Stock”), which shall be deemed paid by the issuance to the Buyer of the Shares at the Closing (as defined herein). Section 2.04 Allocation of Purchase Price. The Purchase Price shall be allocated among the Purchased Tangible Property and Purchased License Rights for all purposes (including tax and financial accounting) in accordance with generally accepted accounting practices and by mutual agreement between Buyer and Seller. Buyer and Seller shall file all tax returns (including amended returns and claims for refund) and information reports in a manner consistent with such allocation. Notwithstanding anything in this Agreement to the contrary, each of the Buyer and Seller will be responsible for one half of the aggregate amount of any and all transfer, sales, value-added, use, excise or similar taxes that may be payable in connection with the sale or purchase of the Purchased Tangible Property and Purchased License Rights. Section 2.05 Withholding Tax. Buyer shall be entitled to deduct and withhold from the Purchase Price all taxes that Buyer may be required to deduct and withhold under any applicable tax law. All such withheld amounts shall be treated as delivered to Seller hereunder. (viii)such other customary instruments of transfer, assumption, filings or documents, in form and substance reasonably satisfactory to Buyer, as may be required to give effect to this Agreement. (iv)a certificate of the Secretary or Assistant Secretary (or equivalent officer) of Buyer certifying as to (A) the resolutions of the board of directors of Buyer, duly adopted and in effect, which authorize the execution, delivery and performance of this Agreement and the transactions contemplated hereby; and (B) the names and signatures of the officers of Buyer authorized to sign this Agreement and the Ancillary Documents. Seller represents and warrants to Buyer that the statements contained in this Article IV are true and correct as of the date hereof. For purposes of this Article IV, “Seller’s knowledge,” “knowledge of Seller” and any similar phrases shall mean the actual or constructive knowledge of any director, officer or member of Seller, after due inquiry. Section 4.01 Organization and Authority of Seller; Enforceability. Seller is a limited liability company duly organized, validly existing and in good standing under the laws of the state of Louisiana. Seller has full corporate power and authority to enter into this Agreement and the Ancillary Documents, to carry out its obligations hereunder and to consummate the transactions contemplated hereby. The execution, delivery and performance by Seller of this Agreement and the Ancillary Documents and the consummation of the transactions contemplated hereby have been duly authorized by all requisite corporate action on the part of Seller. This Agreement and the Ancillary Documents have been duly executed and delivered by Seller, and (assuming due authorization, execution and delivery by Buyer) this Agreement and the Ancillary Documents constitute legal, valid and binding obligations of Seller, enforceable against Seller in accordance with their respective terms. (c)conflict with, or result in (with or without notice or lapse of time or both) any violation of, or default under, or give rise to a right of termination, acceleration or modification of any obligation or loss of any benefit under any Contract to which Seller is a party or to which any of the Purchased Tangible Property or Seller IP are subject; or (d) result in the creation or imposition of any Encumbrance in favor of a third party on the Purchased Tangible Property or Seller IP. Other than Hydro’s consent, no consent, approval, waiver or authorization is required to be obtained by Seller from any Person in connection with the execution, delivery and performance by Seller of this Agreement and the consummation of the transactions contemplated hereby. Section 4.03 Title to Purchased Tangible Property. Seller owns and has good title to the Purchased Tangible Property, free and clear of Encumbrances. (a)Seller owns, free and clear of any Encumbrances, or has a right and/or license to use, as the case may be, all Seller IP. Seller owns sufficient rights and/or interest in the Seller IP to conduct its Business as currently conducted without infringement, misappropriation, or violation of any third party's rights in the Seller IP. to claim of Intellectual Property rights infringement, misappropriation, or violation against Seller with respect to the conduct of Seller's business. (c)Seller has paid all filing fees, maintenance fees and other amounts that have been required to be paid and that were due and owing as of the date hereof under applicable government requirements with respect to the Owned Patent, or under any Contract relating to the Owned Patent. (d)To Seller’s Knowledge, no Person nor such Person’s business or products has infringed, or misappropriated any Seller IP, or currently is infringing, or misappropriating any Seller IP. (e)Seller has maintained commercially reasonable practices to protect the confidentiality of its confidential information and trade secrets and has required all employees, consultants, and other Persons or entities to whom it provided access to its confidential information (other than attorneys, accountants, and others with professional duties of confidentiality, to whom this requirement shall not apply) to execute written agreements requiring them to maintain the confidentiality of such information and to limit his, her or its use of such information on commercially reasonable terms. (f)No employee or consultant of Seller is subject to or otherwise restricted by any employment, nondisclosure, assignment of inventions, non-solicitation of employees or non- competition agreement between such employee or consultant and a third party that has been violated or will be violated as a result of any of the transactions contemplated by this Agreement. (g)Except for licenses to Hydro, Buyer, and the Joint Venture, and as provided in Section 4.04 of the Disclosure Schedules Seller has not granted any license or otherwise transferred any Seller IP to any Person, or agreed to indemnify any third party with respect to any alleged infringement or misappropriation of any third party’s Intellectual Property by Seller, and Seller is not bound by or a party to any options, licenses or Contracts of any kind relating to the Seller IP. Section 4.05 Condition of Assets. The Purchased Tangible Property are in good condition, normal wear and tear excepted), are adequate for the uses to which they are being put, and none of such Purchased Tangible Property are in current need of maintenance or repairs. Section 4.06 Compliance With Laws; Permits. All licenses, franchises, approvals, authorizations, registrations, certificates, variances and similar rights (the “Permits”) obtained, or required to be obtained, from federal, state or local governmental authorities required for the ownership and use of the Purchased Tangible Property have been obtained by Seller and are valid and in full force and effect. All fees and charges with respect to such Permits as of the date hereof have been paid in full. Section 4.06 of the Disclosure Schedules lists all current Permits issued to Seller which are related to the ownership and use of the Purchased Tangible Property, including the names of the Permits and their respective dates of issuance and expiration. No event has occurred that, with or without notice or lapse of time or both, would reasonably be expected to result in the revocation, suspension, lapse or limitation of any Permit set forth in Section 4.06 of the Disclosure Schedules. Section 4.07 Sale in the Regular Course of Business. None of the transactions contemplated by this Agreement, the Ancillary Documents, the Operating Agreement, the Escrow Agreement and the IP Assignment/License constitute a sale of all or substantially all of the Seller’s Assets. Seller (a) relating to or affecting the Purchased Tangible Property or Seller IP; or (b) that challenges or seeks to prevent, enjoin or otherwise delay the transactions contemplated by this Agreement. To Seller’s Knowledge, there are no outstanding governmental orders and no unsatisfied judgments, penalties or awards against, relating to or affecting the Purchased Tangible Property or Seller IP. Section 4.09 Brokers. No broker, finder or investment banker is entitled to any brokerage, finder’s or other fee or commission in connection with the transactions contemplated by this Agreement based upon arrangements made by or on behalf of Seller. Section 4.10 Full Disclosure. No representation or warranty by Seller in this Agreement and no statement contained in the Disclosure Schedules to this Agreement or any certificate or other document furnished or to be furnished to Buyer pursuant to this Agreement contains any untrue statement of a material fact, or omits to state a material fact necessary to make the statements contained therein, in light of the circumstances in which they are made, not misleading. Section 4.11 No Public Sale or Distribution. The Seller is acquiring the Shares for its own account and not with a view towards, or for resale in connection with, the public sale or distribution thereof in violation of applicable securities laws, except pursuant to sales registered or exempted under the Securities Act of 193, as amended (the “1933 Act”). The Seller does not presently have any agreement or understanding, directly or indirectly, with any Person to distribute any of the Shares in violation of applicable securities laws. Section 4.12 Accredited Investor Status. The Seller is an “accredited investor” as that term is defined in Rule 501(a) of Regulation D.
Section 4.13 Reliance on Exemptions. Seller understands that the Shares are being offered and sold to it in reliance on specific exemptions from the registration requirements of United States federal and state securities laws and that Buyer is relying in part upon the truth and accuracy of, and Seller’s compliance with, the representations, warranties, agreements, acknowledgments and understandings of Seller set forth herein in order to determine the availability of such exemptions and the eligibility of Seller to acquire the Shares. Section 4.14 Information. The Seller and its advisors, if any, have been furnished with all materials relating to the business, finances and operations of Buyer and materials relating to the offer and sale of the Shares which have been requested by Seller. Seller and its advisors, if any, have been afforded the opportunity to ask questions of Buyer. Seller understands that its investment in the Shares involves a high degree of risk. Seller has sought such accounting, legal and tax advice as it has considered necessary to make an informed investment decision with respect to its acquisition of the Shares. Section 4.15 No Governmental Review. Seller understands that no United States federal or state agency or any other government or governmental agency has passed on or made any recommendation or endorsement of the Shares or the fairness or suitability of the investment in the Shares nor have such authorities passed upon or endorsed the merits of the offering of the Shares. transferred or otherwise disposed of except after compliance with applicable securities laws (including holding the Shares for at least six (6) months or such other period as required by Rule 144 under the 1933 Act), and after compliance with the holding periods set forth in the Lockup Agreement. Section 4.17 Experience of Seller. Seller, either alone or together with its Representatives, has such knowledge, sophistication and experience in business and financial matters so as to be capable of evaluating the merits and risks of the prospective investment in the Shares, and has so evaluated the merits and risks of such investment. Seller is able to bear the economic risk of an investment in the Shares and, at the present time, is able to afford a complete loss of such investment. Section 4.18 Disclosure. The inclusion of any item on any Disclosure Schedule shall constitute disclosure for all purposes under this Agreement and all such information is deemed to be fully disclosed to the Buyer, and shall not be construed as an indication of the materiality or lack thereof of such item. Buyer represents and warrants to Seller that the statements contained in this Article IV are true and correct as of the date hereof. For purposes of this Article V, “Buyer’s knowledge,” “knowledge of Buyer” and any similar phrases shall mean the actual or constructive knowledge of any director or officer of Buyer, after due inquiry. Section 5.01 Organization and Authority of Buyer; Enforceability. Buyer is a corporation duly organized, validly existing and in good standing under the laws of the state of Delaware. Buyer has full corporate power and authority to enter into this Agreement and the Ancillary Documents, to carry out its obligations hereunder and to consummate the transactions contemplated hereby. The execution, delivery and performance by Buyer of this Agreement and the Ancillary Documents and the consummation of the transactions contemplated hereby have been duly authorized by all requisite corporate action on the part of Buyer. This Agreement and the Ancillary Documents have been duly executed and delivered by Buyer, and (assuming due authorization, execution and delivery by Seller) this Agreement and the Ancillary Documents constitute legal, valid and binding obligations of Buyer enforceable against Buyer in accordance with their respective terms. Section 5.02 No Conflicts; Consents. The execution, delivery and performance by Buyer of this Agreement and the Ancillary Documents, and the consummation of the transactions contemplated hereby, do not and will not: (a) violate or conflict with the certificate of incorporation, by-laws or other organizational documents of Buyer; or (b) violate or conflict with any judgment, order, decree, statute, law, ordinance, rule or regulation applicable to Buyer. Except for the filing with the SEC of a Form 8- K, and any other filings as may be required by state securities agencies, Buyer is not requirement to make any filing or obtain any consent, approval, waiver or authorization from any Person in connection with the execution, delivery and performance by Buyer of this Agreement and the consummation of the transactions contemplated hereby. that may give rise to, or serve as a basis for, any such Action. Section 5.04 Brokers. No broker, finder or investment banker is entitled to any brokerage, finder’s or other fee or commission in connection with the transactions contemplated by this Agreement based upon arrangements made by or on behalf of Buyer. Section 5.05 Issuance of the Shares. The issuance of the Shares is duly authorized and upon issuance in accordance with the terms of this Agreement shall be validly issued, fully paid and non- assessable and free from all preemptive or similar rights, taxes, liens, charges and other encumbrances with respect to the issue thereof. Subject to the accuracy of the representations and warranties of the Seller in this Agreement, the offer and issuance by the Buyer of the Shares is exempt from registration under the 1933 Act. Section 5.06 SEC Reports; Financial Statements; Public Communications; Internal Controls and Disclosure Controls. (a)Since March 31, 2018 and through the date this representation is made, Buyer has filed all reports, schedules, forms, registration statements and other documents required to be filed by it with the SEC pursuant to the requirements of the Securities Exchange Act of 1934 (all of the foregoing, together with any other reports, schedules, forms, registration statements and other documents filed by Buyer with the U.S. Securities and Exchange Commission (the “SEC”) since March 31, 2018 and prior to the date this representation is made (including in each case all exhibits included therewith and financial statements and schedules thereto and documents incorporated by reference therein) being referred to herein as the “SEC Documents” and Buyer’s balance sheet as of September 30, 2018 (the “Buyer Balance Sheet Date”), as included in Buyer’s quarterly report on Form 10-Q for the period then ended, being referred to herein as the “Buyer Balance Sheet”). Buyer has made available by request to the Seller or its representatives true and complete copies of the SEC Documents that are not available on the SEC’s EDGAR system. Since the filing of each of the SEC Documents, no event has occurred that would require an amendment or supplement to any such SEC Document and as to which such an amendment has not been filed and made publicly available on the SEC’s EDGAR system no less than five Business Days prior to the date this representation is made. Buyer has not received any written comments from the SEC staff that have not been resolved to the satisfaction of the SEC staff. (b)As of their respective dates, the financial statements of Buyer included in the SEC Documents (including the notes thereto, the “Buyer Financial Information”) complied as to form in all material respects with applicable accounting requirements and securities Laws with respect thereto. Such consolidated financial statements have been prepared in accordance with GAAP, consistently applied, during the periods involved (except (i) as may be otherwise indicated in such financial statements or the notes thereto, or (ii) in the case of unaudited interim statements, to the extent they may exclude footnotes or may be condensed or summary statements) and fairly present in all material respects the financial position of Buyer as of the dates thereof and the results of its or their operations and cash flows, as applicable, for the periods then ended (subject, in the case of unaudited statements, to normal year-end audit adjustments that are not material individually or in the aggregate). The Buyer Financial Information is true, accurate and complete and is consistent with the books and records of Buyer and its predecessors (which are true, accurate and complete). Since the date of the Buyer Balance Sheet, there has been no change in Buyer’s reserve or accrual amounts or policies. distribute) any other public statement, report, advertisement or communication on behalf of Buyer or otherwise relating to Buyer that contains any untrue statement of a material fact or omits any statement of material fact necessary in order to make the statements therein, in the light of the circumstances under which they are or were made, not misleading or has provided any other information to the Seller that, considered in the aggregate, contains any untrue statement of a material fact or omits to state any material fact necessary in order to make the statements therein, in the light of the circumstances under which they are or were made, not misleading. Section 6.01 Public Announcements. Unless otherwise required by applicable law, neither party shall make any public announcements regarding this Agreement or the transactions contemplated hereby without the prior written consent of the other party (which consent shall not be unreasonably withheld or delayed). Section 6.02 Non-Competition and Confidentiality. (a)In consideration of the Purchase Price and Buyer’s covenants set forth in this Agreement, Seller, on behalf of itself, its officers, directors and its equity holders, agrees that, for the period beginning on the Closing Date and ending two (2) years thereafter, it will not directly or indirectly, participate, engage in any business or activity that (i) exploits certain proprietary technologies being assigned and or licensed to the Company by EcoX designed to extract CBD, THC, as well as additional compounds, from cannabis and hemp plants (the “Technology”) and (ii) manufacturing and marketing equipment derived from the Technology for use in extracting CBD, THC, as well as additional compounds, from cannabis and hemp plants;. (b)For a period of two (2) years beginning on the Closing Date, Seller, its Representatives and its equity holders shall not in any manner, directly, indirectly, individually, in partnership, jointly or in conjunction with any Person, (i) recruit or solicit or attempt to recruit or solicit, on its behalf or on behalf of any other Person, any employee of Buyer or an affiliate of Buyer, as an employee or consultant; (ii) encourage any Person (other than Buyer or an affiliate of Buyer) to recruit or solicit any employee of Buyer or an affiliate of Buyer; (iii) otherwise encourage any employee of Buyer or an affiliate of Buyer to discontinue his or her employment with Buyer or an affiliate of Buyer; (iv) solicit any customer of Buyer, Seller or an affiliate of any Party who is or has been a customer on or prior to the Closing Date for the purpose of providing, distributing, marketing or selling products or services similar to those sold or provided by Buyer; or (v) persuade or attempt to persuade any customer or supplier of Buyer or an affiliate of Buyer to terminate or modify such customer’s or supplier’s relationship with Buyer or an affiliate of Buyer. relief, including, without limitation, specific performance, from any court of competent jurisdiction without posting a bond or similar security in the event of any breach or attempted breach of this Section 6.03, and Seller on behalf of itself, its Representatives and its equity holders, hereby consents to the granting by any court of an injunction or other equitable relief, without the necessity of actual monetary loss being proved, in order that the breach or threatened breach of such provisions may be effectively restrained. The rights and remedies provided by this Section 6.03 are cumulative and in addition to any other rights and remedies which Buyer may have hereunder or at law or in equity or otherwise. (iii) has become publicly known and made generally available through no wrongful act of Seller or its Representatives. contained in this Section 6.03 shall for any reason be held to be unreasonable with regard to time, duration, geographic scope or activity, the parties contemplate and hereby agree that such restriction shall be modified and shall be enforced to the extent compatible with applicable law. Section 6.04 Further Assurances. Following the Closing, each of the parties hereto shall execute and deliver such additional documents, instruments, conveyances and assurances and take such further actions as may be reasonably required to carry out the provisions hereof and give effect to the transactions contemplated by this Agreement and the Ancillary Documents, including assignment by Seller of the Seller IP to the Joint Venture. Section 7.01 Survival. The representations and warranties of the parties set forth herein shall survive for a periods of one-year after Closing. All covenants and agreements contained herein and all related rights to indemnification shall survive the Closing. (c)the use, operation, ownership and/or exploitation of the Purchased Tangible Property and/or the Seller IP on or prior to the Closing Date. (c)the use, operation, ownership and/or exploitation of the Purchased Tangible Property and/or the Seller IP following the Closing Date. written notice of such claim to the other party (the “Indemnifying Party”). In connection with any claim giving rise to indemnity hereunder resulting from or arising out of any Action by a Person or entity who is not a party to this Agreement, the Indemnifying Party, at its sole cost and expense and upon written notice to the Indemnified Party, may assume the defense of any such Action with counsel reasonably satisfactory to the Indemnified Party. The Indemnified Party shall be entitled to participate in the defense of any such Action, with its counsel and at its own cost and expense. If the Indemnifying Party does not assume the defense of any such Action, the Indemnified Party may, but shall not be obligated to, defend against such Action in such manner as it may deem appropriate, including, but not limited to, settling such Action, after giving notice of it to the Indemnifying Party, on such terms as the Indemnified Party may deem appropriate and no action taken by the Indemnified Party in accordance with such defense and settlement shall relieve the Indemnifying Party of its indemnification obligations herein provided with respect to any damages resulting therefrom. The Indemnifying Party shall not settle any Action without the Indemnified Party’s prior written consent (which consent shall not be unreasonably withheld or delayed). Section 7.05 Tax Treatment of Indemnification Payments. All indemnification payments made by Seller under this Agreement shall be treated by the parties as an adjustment to the Purchase Price for tax purposes, unless otherwise required by law. Section 7.06 Effect of Investigation. Buyer’s right to indemnification or other remedy based on the representations, warranties, covenants and agreements of Seller contained herein will not be affected by any investigation conducted by Buyer with respect to, or any knowledge acquired by Buyer at any time, with respect to the accuracy or inaccuracy of or compliance with, any such representation, warranty, covenant or agreement. Section 7.07 Cumulative Remedies. The rights and remedies provided in this Article VII are cumulative and are in addition to and not in substitution for any other rights and remedies available at law or in equity or otherwise. Notwithstanding anything to the contrary set forth herein, the maximum liability of the Seller hereunder shall not exceed the Purchase Price (as determined by the value of the Shares issued to Seller on the date hereof), any indemnification obligation of Seller under this Article VII may be satisfied by Seller by the redemption of such Shares to Buyer. Section 8.01 Expenses. All costs and expenses incurred in connection with this Agreement and the transactions contemplated hereby shall be paid by the party incurring such costs and expenses. If to Buyer:Newbridge Global Ventures, Inc. Section 8.03 Headings. The headings in this Agreement are for reference only and shall not affect the interpretation of this Agreement. Section 8.04 Severability. If any term or provision of this Agreement is invalid, illegal or unenforceable in any jurisdiction, such invalidity, illegality or unenforceability shall not affect any other term or provision of this Agreement or invalidate or render unenforceable such term or provision in any other jurisdiction. Section 8.05 Entire Agreement. This Agreement and the Ancillary Documents constitute the sole and entire agreement of the parties to this Agreement with respect to the subject matter contained herein, and supersede all prior and contemporaneous understandings and agreements, both written and oral, with respect to such subject matter. In the event of any inconsistency between the statements in the body of this Agreement and the Ancillary Documents, the Exhibits and Disclosure Schedules (other than an exception expressly set forth as such in the Disclosure Schedules), the statements in the body of this Agreement will control. Section 8.06 Successors and Assigns. This Agreement shall be binding upon and shall inure to the benefit of the parties hereto and their respective successors and permitted assigns. Neither party may assign its rights or obligations hereunder without the prior written consent of the other party, which consent shall not be unreasonably withheld or delayed. No assignment shall relieve the assigning party of any of its obligations hereunder. Section 8.07 No Third-party Beneficiaries. Except as provided in Article VII and the Joint Venture entity, this Agreement is for the sole benefit of the parties hereto and their respective successors and permitted assigns and nothing herein, express or implied, is intended to or shall confer upon any other Person any legal or equitable right, benefit or remedy of any nature whatsoever under or by reason of this Agreement. Section 8.08 Amendment and Modification. This Agreement may only be amended, modified or supplemented by an agreement in writing signed by each party hereto. Section 8.09 Waiver. No waiver by any party of any of the provisions hereof shall be effective unless explicitly set forth in writing and signed by the party so waiving. No waiver by any party shall operate or be construed as a waiver in respect of any failure, breach or default not expressly identified by such written waiver, whether of a similar or different character, and whether occurring before or after that waiver. No failure to exercise, or delay in exercising, any right, remedy, power or privilege arising from this Agreement shall operate or be construed as a waiver thereof; nor shall any single or partial exercise of any right, remedy, power or privilege hereunder preclude any other or further exercise thereof or the exercise of any other right, remedy, power or privilege. Section 8.10 Governing Law. This Agreement is governed by and will be construed, interpreted and the rights of the parties determined in accordance with the laws of the State of Delaware without regard to principles of conflicts of law, except that, with respect to matters of law concerning the internal corporate affairs of any corporate entity which is a party to or the subject of this Agreement, the law of the jurisdiction under which the respective entity was organized will govern. Section 8.11 Consent to Jurisdiction and Venue. Each Party to this Agreement hereby (i) consents to submit himself, herself or itself to the personal jurisdiction of the Federal courts of the United States located in Delaware or, if such courts do not have jurisdiction over such matter, to the applicable courts of the State of Delaware located in Wilmington, Delaware, (ii) irrevocably agrees that all actions or proceedings arising out of or relating to this Agreement will be litigated in such courts and (iii) irrevocably agrees that he, she or it will not institute any Proceeding relating to this Agreement or any of the transactions contemplated hereby in any court other than such courts. Each party to this Agreement accepts for himself, herself or itself and in connection with his, her or its properties, generally and unconditionally, the exclusive jurisdiction and venue of the aforesaid courts and waives any defense of lack of personal jurisdiction or inconvenient forum or any similar defense, and irrevocably agrees to be bound by any non-appealable judgment rendered thereby in connection with this Agreement. Section 8.12 Waiver of Jury Trial. THE PARTIES HERETO WAIVE ANY RIGHT TO TRIAL BY JURY IN ANY ACTION OR PROCEEDING ARISING OUT OF OR RELATING TO THIS AGREEMENT OR ANY TRANSACTION CONTEMPLATED HEREBY, WHETHER NOW EXISTING OR HEREAFTER ARISING, AND WHETHER SOUNDING IN CONTRACT, TORT OR OTHERWISE. THE PARTIES AGREE THAT ANY OF THEM MAY FILE A COPY OF THIS PARAGRAPH WITH ANY COURT AS WRITTEN EVIDENCE OF THE KNOWING, VOLUNTARY AND BARGAINED-FOR AGREEMENT AMONG THE PARTIES TO IRREVOCABLY WAIVE TRIAL BY JURY AND THAT ANY ACTION OR PROCEEDING WHATSOEVER AMONG THEM RELATING TO THIS AGREEMENT OR ANY TRANSACTION CONTEMPLATED HEREBY WILL INSTEAD BE TRIED IN A COURT OF COMPETENT JURISDICTION BY A JUDGE SITTING WITHOUT A JURY. Section 8.13 Specific Performance. The parties agree that irreparable damage would occur if any provision of this Agreement were not performed in accordance with the terms hereof and that the parties shall be entitled to specific performance of the terms hereof, in addition to any other remedy to which they are entitled at law or in equity. Section 8.14 Counterparts. This Agreement may be executed in counterparts, each of which shall be deemed an original, but all of which together shall be deemed to be one and the same agreement. A signed copy of this Agreement delivered by facsimile, e-mail or other means of electronic transmission shall be deemed to have the same legal effect as delivery of an original signed copy of this Agreement.